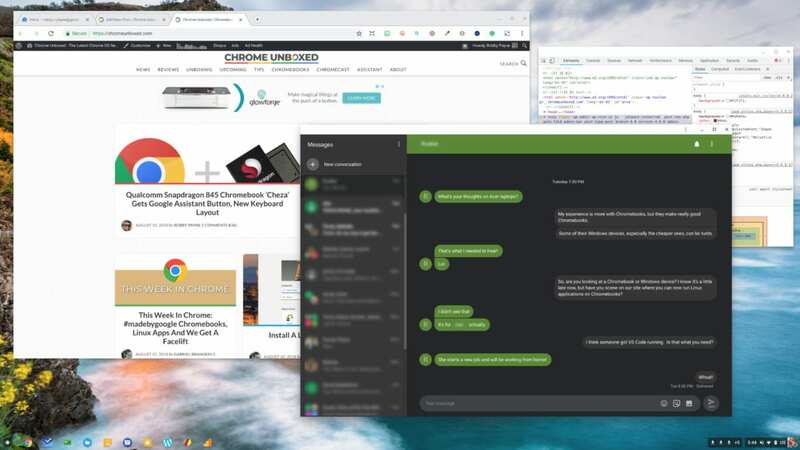 If you didn’t already know, Android Messages is available on just about any device running Chrome, not just Chromebooks. The overall usability has been pretty great for me and I’d assume many of you out there are taking advantage of Android Messages on the web. For Chromebook users, the ability to set this to simply open in a window without all the normal browser stuff up in the header really makes Android Messages feel like a native app right on your Chromebook. For this one, the instructions are short, so I’ll even throw in how to get all of this up and running as we’ve not really covered the process before. First, go over to messages.android.com/web. Once you are there, open up the Android Messages app on your phone. Second, click the 3-dot menu in the top right corner of the app and select – you guessed it – Messages for web. Third, click the Scan QR Code button and point your phone at the screen on your laptop/desktop. Before that, make sure to switch the “Remember this computer” on. That’s it! You now have Android Messages for Web set up. If you want to go for that native feel, simply click your 3-dot menu in the tab you have Messages open in, select Create shortcut, and you’ll now have Messages pinned in your tray and app launcher. Right click on that new icon and you’ll be able to select Open as window and now you have what feels like a native Android Messages app right on your Chromebook. Believe it or not, this is even simpler. All you need to do is open up that new Messages “app” we just created and in the upper portion above all your text threads, click the 3-dot menu. You’ll see settings, Archived and then Enable dark theme. Click on that and you will get the quite-slick dark theme for Android Messages on Chrome. I have to admit, it looks pretty sweet and I’ve kept this turned on since I stumbled across it. On Android, this mode has been turned on and then temporarily removed. In fact, I’ve never seen the option on my Pixel 2 XL, so I’m really glad it is on the web version and has not been removed along with the phone counterpart.